Well, consensus investing is always a disaster. Treasuries is the most reviled asset class; just go to Seeking Alpha. Well, I was starting to become bullish on treasuries. One reason that inspired me because I expect the returns on capital (in developed markets) to be very low because of globalization of labor that would reduce purchasing power. Also, innovation and overcapacity would cause low margins. Regarding innovation, I am thinking, for example, that netbooks would reduce Microsoft's margin from Windows, and Vista might reduce the margin from anti-virus software. Thus, the opportunity cost of buying Treasuries would be lower. I think your argument would be strengthened if you compare the prices of global equities. High returns might not be possible in the developed world (maybe Australia though), and that is one reason why investors would accept low yields in Treasuries. Do you have any information about the growth priced-in in emerging market equities and their risk premium? Also, I am interested in macro-economic factors that might increase returns. Since emerging markets are "hot" in 2005-08, maybe there's overcapacity there and competition between firms there. Also, global labor overcapacity might decrease wages and consumer spending power so the firm's cash flow would be lower in emerging markets. Capital can race to the bottom and go to Bangladesh or Pakistan if labor gets too expensive in emerging markets. I also loved this part of the essay: in the spirit of Karl Popper, you provided scenarios in which your hypothesis (treasuries yields will fall) will be falsified. Please post more articles though. Thanks for the feedback! I agree that there are other arguments that could favor treasuries, and I also agree that a comparison to equities (ultimately the outlook for earnings and dividends) would be a good one. I haven't been able to find data on Japan's earnings and dividends before and after 1990, but it would be a useful basis for comparison with today's situation. Perhaps I'll do a second version of this post in the future if I have more to add, but I initially wanted to tackle some of the ideas that I see most commonly from treasury bears. I don't have much insight on emerging markets, sorry. My own remark on emerging markets was a counterargument against my argument that investors will buy Treasuries because they do not expect a high return on investment with a good risk/reward elseware. They might put it in emerging markets as that was the hot market of the 2000s. I assume most retail investors do not know what "discounted cash flow" is, so they would rely on agents to buy securities for them. These agents are most likely motivated by short-term gains and status so they could look relatively good in the short-run. I am also bearish on gold now, since everyone is already positioned (long) for it, and I am currently accepting the thesis that the bear market rally will last for some time. (Maybe it has about 7% more to go). This would reduce demands for safe havens. Bullish on silver in the long term because I expect the large "bling-bling" premium for gold and silver to decline (~70:1), and it has more industrial applications so it would rise if there is more emerging market demand for it. Also, a growing distrust of central bankers would also cause that metal to rise. And the best part, not many people are positioned in silver; everyone is a gold bug. Basically, if I had money to speculate on: I'll use this my investment thesis: US (and possibly post-Thatcher Britain) = Japan; except with more immigration and globalized labor competition now. I think we're roughly on the same page as to overall outlook. As to your post, it seems reasonable and overlaps somewhat with my thoughts, though you also comment on areas I know less about. One of the key factors really does seem to be what happens to earnings and dividends -- I don't have any better guesses than your projections but as I mentioned before would love to compare more historical scenarios in detail, especially for Japan, if I can find data. I did some digging on Japan post-1990 P/E ratios and it seems like they were sustained at pretty high levels, and I'm not yet sure why. I think that we should not separate politics and economy. I think that your post is invaluable as it explains one of the greatest mysteries - why despite the crisis the US government still obsessively tries to expand its influence across the world - in Georgia or Ukraine for example - which are as close to Russia proper as Montreal to the US. Why they are trying to meddle everywhere and step on toes on every other country in the world if they think it may even marginally benefit them. I was born 100 km away from the planned US interceptor missile site in Redzikowo in Poland so I may have a bit biased view on this insane idea of building it there as the nuclear dust may kill my family still living in the area. And there is another city of 100.000 just 5 km away where the idea is not popular either... Never mind the Polish government doesn't have any doubts that being the nuclear target increases the safety of the nation. So a perpetual motion has been discovered in the name of US treasury bonds and this will power the empire for very long until nuclear fusion is harnessed. I am not an economist so I don't believe in Fibonacci numbers and can commit a crime in not believing that the stock/financial market reality is the only true reality. Why do people invest in financial products? Because they expect return on their investment or because they expect the price to rise. The second mechanism powers all the bubbles. Looking at the US economy I cannot see the way they can generate healthy return and pay back the debt by exporting more overseas than they have to spend on commodities (mainly oil) and all the consumer goods from China. But for now US treasury bonds have been branded as the most safe investment because US is the country least likely to default and "the only remaining superpower". So they can be easily rolled over and their volume increased. Since the bond-selling (I would say bonk-selling) mechanism worked well so far it will also work in the future. This reasoning uses the same principle as mathematical induction - prove that something is true for n=1 and then prove that the fact that it is true for n implies that it's true for n+1. As long as there is enough "confidence" the perpetual motion device moves forward powered by the power of human thought. Everyone will keep buying - you and me. Since everyone must have confidence in the Last Remaining Empire the 21th century will belong to America. Well one can question that. 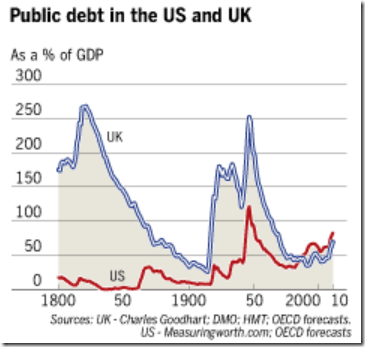 Another stable state can be considered - that the US cannot pay the debt by exporting goods, they have permanent fiscal deficit and the economy which cannot compete with Asia. The US dollar must be devalued for example 3 times to make the economy competitive. Therefore US bonds and US dollar (the global currency) are potentially dead however they are the strongest at the same time. This contradiction gives the potential for a crash at any time but there are well-known arguments that for example the Chinese won't dump the bonds as it would hurt them more than the Americans. The tipping point is unknown but I think it exists. What if the US has some enemies? What if they are one of the most hated countries across the world because of all the meddling, exporting "democracy", screwing up allays and exploitation? The possibility of a cold financial war has already been explored by Pentagon (guess who won). The ultimate tipping point will be the inevitable increase of commodity prices due to the rise and rise and rise of China. And running out of cheap oil. However I think that you are right - for now the system is stable, the empire is expanding, Russians are buying bonds. Let's build this missile interceptor and see how it goes... This will not be the tipping point for sure. 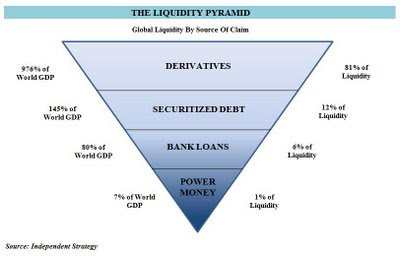 Anon- My guess is that the dynamics I described would probably apply not just to the US but to any country (UK, Australia, etc) with a large domestically denominated private debt (and therefore deleveraging) and a small foreign-currency denominated debt. I do not know if it is a good idea to long Treasuries now. The bond market seems to be betting against a recovery or inflation (despite what the inflationists on Seeking Alpha are saying). Do you think a 210 bp for 5 years is pricing in a recovery or inflation. 2.10% yield is not enough to protect against inflation? 210 bp for 5 years is a very high opportunity cost if one expects the returns on capital to be higher. It would be more tempting to put on a long position when perceptions significanly diverge from reality. (Which doesn't seem to be the case.) Initiating equity shorts now seems to be a better risk/reward than going long (with leverage) on Treasuries now. Do you have any commentary on what the Treasury market is pricing in? Not really... I'm not a trader, just someone interested in macroeconomic theory and trying to share what I've learned with some folks who have asked me. My focus with respect to sovereign debt is on the medium term, not the month to month fluctuations. The point of my post is that I'd be surprised if treasury yields weren't roughly flat or lower over the next several years (whether or not they spike short term). But I'm also happy to see evidence of why my reasoning might be wrong. As for whether 5 year inflation levels are priced in -- I don't know, but if deflation comes anywhere close to historical experience, it seems likely. Regarding my short-term perspective on Treasury yields, I think they would go up this month, and then down in the next month. If I had speculative capital, I wouldn't short Treasuries because the risk/reward isn't attractive for the short-term. This is not a criticism on your thesis, but just a remark. If you are a speculator, you cannot simply say Treasuries prices are going up and then buy. The risk/reward for the trade has to be justifed. The best trades come when there is a significant divergence from perception and reality. Of course, the perception, from what I read from Seeking Alpha, is that there would be significant inflation, not deflation because of that smart guy with a 1590 who has a helicopter. No one seems to be betting on a recovery though although Jim Cramer seems to talk about it (for what it is worth). Despite the universal bearishness on Treasuries on Seeking Alpha, it doesn't seem that the bond market shares those perceptions (of inflation) because of the low yield on the 5 year Note. Everyone (most Austrian school-oriented people on Seeking Alpha and money managers) seems to be talking about inflation, but the actual bond market is not reflecting these expections. Perhaps, Bernanke already bid-up the prices. For those bullish on Treasuries, it seems that the bond market still agrees with you on deflation, and that diminishes the reward for going long. Well, at least Japan was able to keep its GDP up by spending (I loved that talk by Richard Koo), I do not know if stimulus would work in the US though. The US has service economy, and it seems that the job market is a zero-sum game. However, Japan could be sustained by foreign demand of its exports. 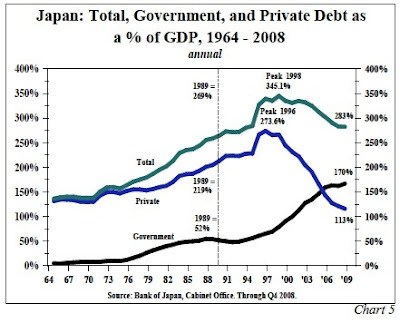 At least Japan's debt to GDP ratio didn't rise because GDP dropped too. Competition from developing countries cut into Japan's market share for its exports though, although the effects on wages would be somewhat mitigated as they have a stakeholder perspective, not a shareholder perspective. Eventually wages are cost that have to be cut in order to remain "competitive." Another argument is that other governments might crowd out the US since everyone is issue bonds.